Coleraine's Jamie McGonigle celebrates his goal against Ballinamallard. Picture - @Press Eye Ltd Northern Ireland. Coleraine boss Oran Kearney feels it is safe to say their defeat at Dungannon a few weeks ago was merely a blip. The stats certainly back him up as the Bannsiders are unbeaten since that fateful day at Stangmore winning three and drawing one of their games. “I told the players I wanted the Dungannon game to be just a blip, and four games on I can comfortably call that game a blip,” said Kearney. Carrick Rangers are on Coleraine’s radar next and Kearney is expecting a tough encounter despite the opposition’s poor start to the season. 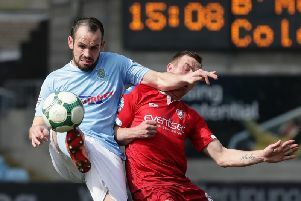 “Carrick have signed well and it will be no different to how it was Ballinamallard last week, or the game before that,” he said. “The name means nothing now, it’s just the next tough game. Carrick manager Kieran Harding will be hoping his side can turn things around quickly, especially after their 4-0 thumping at Portadown last Saturday. “Consistency is always going to be hard when putting together so many new players but the enormity of the game did not seem to hit home,” said Harding.